If you are, what youre about to read on this page will forever shatter your pre-conceived notions about what it really takes to make money from your blog as an affiliate marketer. Pay no attention to the people who failed in affiliate marketing, because they just want you bring you down with them. Affiliate marketing is easy. Its just a simple formula that anyone can learn and duplicate to achieve huge levels of success in a very short time. In fact, affiliate marketing is so easy that once you get the hang of it, youll be able to do it with your hands tied! You hear about all the super affiliates whore getting hundreds of thousands of visitors to their websites and you wonder How can I ever compete with these guys?.. The truth is, you dont need loads of traffic or a huge advertising budget to make some serious money with affiliate marketing and blogging. Wrong. The last thing you need to success online as an affiliate blogger is a Degree in Computer Science. You dont need to be a programmer or a web designer to start cranking in some affiliate commissions! Well reveal to you how easy it really is - for anyone - to become a super affiliate when they have access to the right tools and the right know-how. 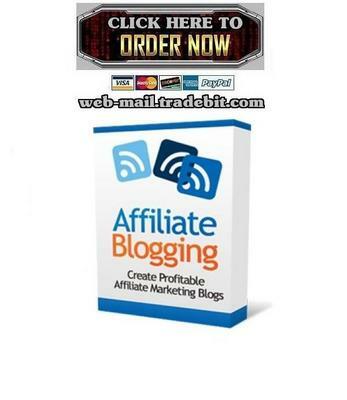 Super Affiliate Bloggers Focus on Just Thing - Building a Profitable Affiliate Blogs with WordPress! If you look at the bloggers who really make a killing online from their blogs, they all focus on just one thing - building highly profitable affiliate marketing blog with WordPress! 7. Repeat over and over again with other sites..
Thats it - just six simple steps to making more money from affiliate programs that youve ever dreamed of! With Affiliate Blogging Videos I will reveal the exact tactics and strategies used by millionaire affiliate bloggers to dominate niche markets and squeeze every last penny out of everyone with very little work. ClickBank is the worlds largest digital products marketplace, where you can buy and promote anything from e-books to memberships and even website templates. Want to promote ClickBank products and make up to 75 in commissions? We reveal how easy it is to find profitable products to promote, then how to create your own unique HopLink and finally how to insert it into the content of your WordPress blog. Did you know you can create automatically-updating ClickBank ads - known as HopAds - and put them on your website? Commission Junction or CJ is one of the oldest and largest affiliate networks - selling everything from physical products to financial products and Pay-Per-Lead offers. Once youve joined a merchant program in CJ, you need to get your affiliate banners, affiliate links and product ads. If youre not using SmartZones in CJ, youre missing out on one of the best tools ever developed for affiliate marketers. Well explain how SmartZones work, and how to use them to rotate and track banners on your blog. If youre blogging for money, then youll need to put banners on many different parts of your blog. Whether its affiliate banners or paid banners, we reveal how to manage and track them using an awesome plugin for WordPress.